BroadcastHashJoinExec is a binary physical operator to perform a broadcast hash join. BroadcastHashJoinExec is created after applying JoinSelection execution planning strategy to ExtractEquiJoinKeys-destructurable logical query plans (i.e. INNER, CROSS, LEFT OUTER, LEFT SEMI, LEFT ANTI) of which the right physical operator can be broadcast. BroadcastHashJoinExec supports Java code generation (aka codegen). BroadcastHashJoinExec requires that partition requirements for the two children physical operators match BroadcastDistribution (with a HashedRelationBroadcastMode) and UnspecifiedDistribution (for left and right sides of a join or vice versa). The prefix for variable names for BroadcastHashJoinExec operators in CodegenSupport-generated code is bhj. codegenInner is used exclusively when BroadcastHashJoinExec is requested to generate the Java code for the "consume" path in whole-stage code generation. 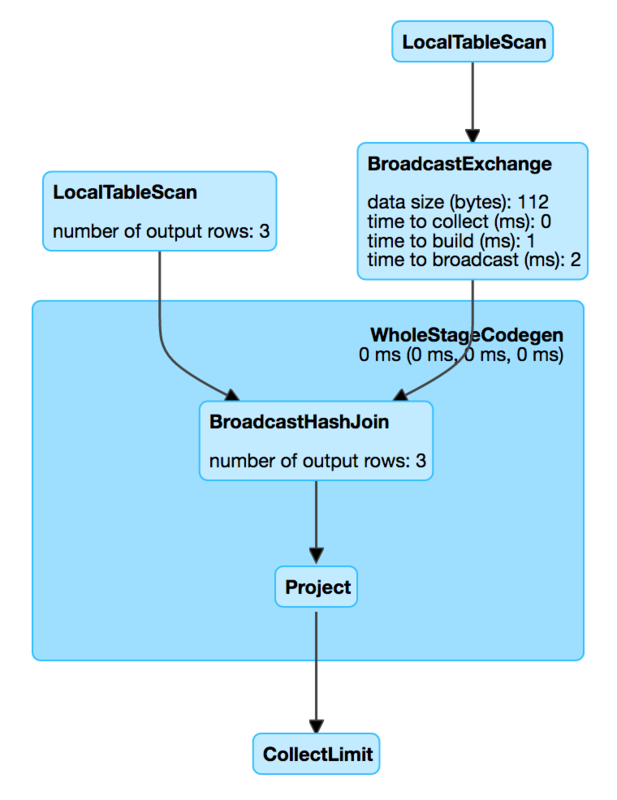 codegenOuter is used exclusively when BroadcastHashJoinExec is requested to generate the Java code for the "consume" path in whole-stage code generation. codegenSemi is used exclusively when BroadcastHashJoinExec is requested to generate the Java code for the "consume" path in whole-stage code generation. codegenAnti is used exclusively when BroadcastHashJoinExec is requested to generate the Java code for the "consume" path in whole-stage code generation. codegenExistence is used exclusively when BroadcastHashJoinExec is requested to generate the Java code for the "consume" path in whole-stage code generation. genStreamSideJoinKey is used when BroadcastHashJoinExec is requested to generate the Java source code for inner, outer, left semi, anti and existence joins (for the "consume" path in whole-stage code generation).